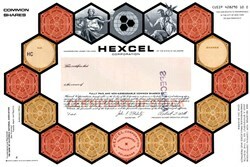 Beautiful certificate from the Hexel Corporation . This historic document was printed by the United States Bank Note Company and has an ornate border around it with a vignette of greek gods and a hexagon pattern as the border. This item has the printed signatures of the Company's President, and Secretary. Stamped specimen on back. Hexcel (NYSE: HXL) is a materials company incorporated in Delaware and headquartered in Stamford, Connecticut, that manufactures composite materials and structural parts. The company was founded in 1946, and its first product was supplying honeycomb for the construction of military bombers. Hexcel claims to be the largest US producer of carbon fiber; a weaver of structural fabrics; the largest producer of composite materials such as honeycomb, prepreg, film adhesives and sandwich panels; and a manufacturer of composite parts and structures. Hexcel's primary markets are aerospace, defense, wind energy and industrial markets including automotive, marine and recreation. In 1971, Hexcel was a manufacturer of alpine skis, and it presently supplies composite materials for ski and snowboard manufacture. Hexcel has manufacturing facilities in West Valley City, Utah; Casa Grande, Arizona; Seguin, Texas; Decatur, Alabama; Pottsville, Pennsylvania; Burlington, Washington; Parla, Spain; Duxford, Cambridgeshire; Neumarkt im Hausruckkreis, Austria; Tianjin, China; Les Avenieres, France; Dagneux, France; and Welkenraedt, Belgium. Hexcel is publicly traded on the New York Stock Exchange under the ticker symbol HXL.